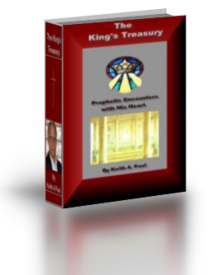 If you are facing difficulties and were drawn to THE KING'S TREASURY because you have financial, circumstantial or material needs then this E Book will be a blessing to you. I lay down several Key Principles in Chapter Two and other sections of this book that will give you breakthrough in these important areas. God is able to release abundance even when the economy is depressed. Add this Ebook to your order list and see God change your situation. Discover His Riches..... Experience His Glory. This book is prophetic in content and about relationship with God. When you enter into spiritual intimacy with Him you have break though, healing, provision, guidance, authority, compassion and power. Prophetically, God is speaking to the Bride of Christ about intimate fellowship with Him. He will open His Treasury to those who pursue Him into the secret places of His Presence. This book will impact your heart and lead you into His Presence.